FARMINGTON, ME (April 12, 2019)—The University of Maine at Farmington Visiting Writers Series season comes to a close with a reading by award-winning author Alex Marzano-Lesnevich on Thursday, April 18, 2019, in The Landing in the UMF Olsen Student Center. The reading is free and open to the public and will be followed by a meet and greet with the author. 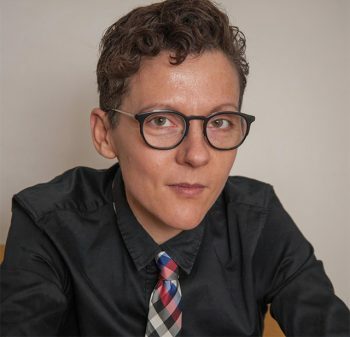 Marzano-Lesnevich is the author of “The Fact of a Body: A Murder and Memoir.” It received the 2018 Lambda Literary Award for Lesbian Memoir, the 2018 Chautauqua Prize, and the 2019 Prix France Inter-JDD – an award for one book of any genre in the world. Named one of the best books of the year by Entertainment Weekly, Audible.com, Bustle, Book Riot, The Times of London, The Guardian, and the Sydney Press Herald, it will be translated into nine languages. The recipient of fellowships from The National Endowment for the Arts, MacDowell, and Yaddo, as well as a Rona Jaffe Award, Marzano-Lesnevich has essays published or forthcoming in The New York Times Sunday Magazine, Oxford American and Harpers. They live in Portland, Maine and are an assistant professor of English at Bowdoin College. The Visiting Writer Series is sponsored by the UMF Bachelor of Fine Arts in Creative Writing Program. As the only Bachelor of Fine Arts in Creative Writing program in the state of Maine and one of only three in all of New England, the UMF program invites students to work with faculty, who are practicing writers, in workshop-style classes to discover and develop their writing strengths in the genres of poetry, fiction, and non-fiction. Small classes, an emphasis on individual conferencing, and the development of a writing portfolio allow students to see themselves as artists and refine their writing under the guidance of accomplished and published faculty mentors. Students can pursue internships to gain real-world writing and publishing experience by working on campus with The Sandy River Review, a student-run literary magazine; Ripple Zine, a feminist magazine; The Farmington Flyer, a university newspaper; or Alice James Books, an award-winning poetry publishing house.